The excavation work in Antalya's Demre district has been ongoing for 27 years, with the most recent dig being conducted by a team from Hacettepe University lead by Professor Sema Doğan. Along with a team of five scientists, 10 students and 13 site workers, Doğan has been working to unearth the western part of the site for two years. The recent find of a two-story building at the site is an exciting discovery for the team. The vaulted structure with a monumental entrance was found to the west of the Saint Nicholas Memorial Museum's courtyard. The outer courtyard also contained a special water well. A full ancient graveyard was also unearthed at the building's entrance. Two of the burial places have been opened, revealing the remains of eight people in one of the graves. Priests or clergymen were likely laid to rest in the front graves, evidence suggests. Drawings have also been located on the walls of the structure, which are believed to depict Jesus Christ, Mary, and Saint Nicholas. A team of Anthropologists have begun studying the newfound wall-etchings. 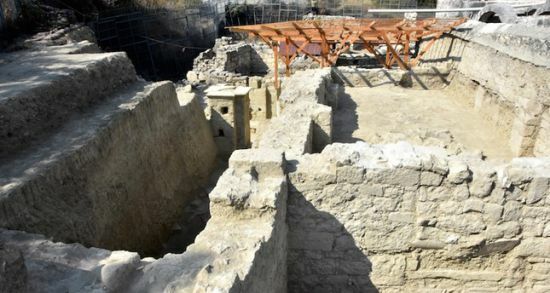 Assistant leader of the excavation Sema Fındık told DHA, "In 2017, we continued digging on the western flank of the church, this is how we found this new two-story building. We then figured out that there was a graveyard at the entrance of the building,"
"After that, we came across the drawings, when we continued digging we realized the structure was far bigger than we initially thought. We'll continue our excavation work and discover the full extent of this new building," she said. Saint Nicholas, also known as Nikolaos of Myra, was a 4th century Christian saint and Greek bishop in Myra, located on modern-day Turkey's southern Mediterranean coast. Known for his habit of gift giving he served as inspiration for the Dutch figure of "Sinterklaas," which eventually was shorted to "Santa Claus."